If ancient Greeks were transported to the rural Ukraine of the 21st century, they would have been surprised to see elements of their designs used with a liberal hand. A faux Greek portico attached to a housing unit meant “a cultural institution” to Soviet planners. Many mini-Parthenons dot the bucolic landscapes, the so-called Houses of Culture that once disseminated the light of the Marxist credo and hosted weekly village dances and now shelter shops and offices, capitalist style. The Bolshevik Revolution of 1917 rejected much about the old order–the language, the traditions, the customs, the family allegiances, but such was the power of classical art that the Soviet style became defined by it. Culture had to come with Doric columns in tow. 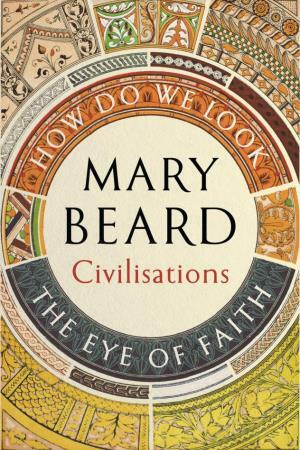 Mary Beard’s book Civilisations: How Do We Look/The Eye of Faith (public library) is about the way we look at art and the notions we have about it. A renowned historian of the ancient world looks at the way people throughout history thought of art and expressed their ideas of themselves by both creating it and interacting with it. The Soviet example is a good illustration for Beard’s idea of art as used to inscribe certain values and principles into the landscape and into daily life. In telling her story, Beard travels from ancient Egypt to Greece and from England to Turkey and beyond. Her examples range from the ancient funerary statues of Greek maidens to the Istanbul mosques. 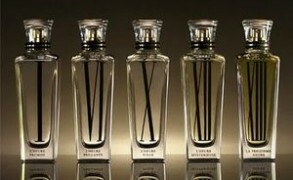 Her topics are likewise eclectic–art and the idea of the body, art and the conception of the polity, art and religion. Instead of telling us what art instructs us to be, Beard probes the question of how we look at art and what we ask of it. She brings the viewer into the picture. Beard doesn’t take the concept of civilization for granted–what is it, who defines it, and her exploration of it alone is worth the time spent with the book. Kenneth Clark, who wrote the original BBC Civilisation series, said that civilization was something he thought he could recognize when he saw it. Beard isn’t so sure that civilization is such a self-evident idea. As she comments, “‘we know that ‘we’ are civilised by contrasting ourselves with those we deem to be uncivilised, with those who do not –or cannot be trusted to –share our values.” Think of how often in current political debates we hear the word “values”–Western values, European values, the so-called civilized values. Civilization is as much about closing doors in the face of others with “different values,” as it is about opening them. Beard has many gifts, and among them is her ability to animate the world of antiquity and to draw links between people living thousands of years ago and us today. She fuses color into images of ancient Greece and Rome, sometimes literally so by reminding us that Greeks used to color their statues in bright, often garish hues. She makes events in the distant past real and significant. The second part of the book has Beard look at religion and the debates surrounding the representation of the divine. Her training in the classics gives her an interesting perspective to examine topics as diverse as representing God in human form or the destruction of art in the name of piety, morality or progress. I particularly like the discussion of calligraphy in Islamic art. Despite the common notion that in Islam representations of God are forbidden, Beard argues that God is indeed represented–as a word. I remembered standing in the Jameh Mosque in the Iranian city of Yazd. 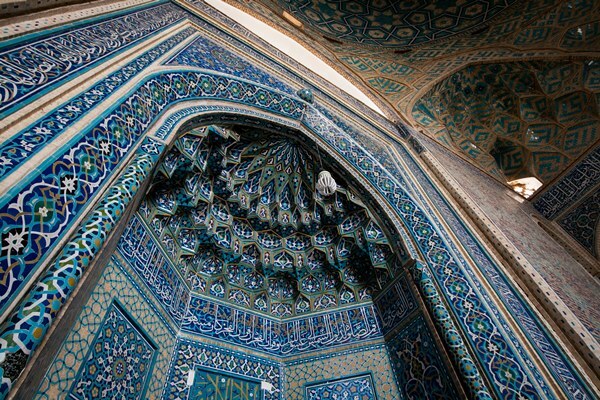 It glittered with turquoise tiles decorated with arabesques and flowers and I stood for a long time with my head thrown back enjoying the azure glow around me. And then suddenly I realized that the twists and turns on the tiles were no simple decorations, but were the 99 Names of God. They gave me a shiver and a thrill of discovery, these talking walls of the Yazd mosque. Since the book is based on the BBC series Civilisations, along with David Olusoga and Simon Schama, Beard at times merely skims the surface without diving as deep into each topic as I would have wished. Nevertheless, Civilisations: How Do We Look/The Eye of Faith is still an engaging and thought-provoking work. Its biggest value for me was inspiring the curiosity to delve deeper. (The thorough bibliography at the end of the book is a boon.) Beard also prompted me to see familiar artworks in a new light. Art is not static, the historian reminded me. Every time the viewer stands in front of a painting, reads a book, or listens to a piece of music, she brings her own experiences and ideas. The viewer becomes the co-creator. The art becomes the mirror. 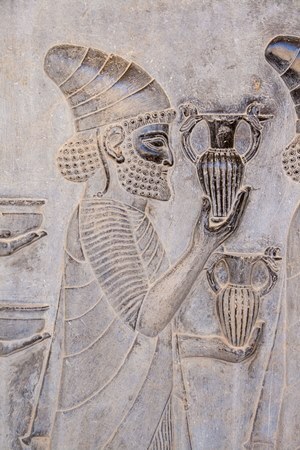 Images: carved relief at Persepolis, Iran; Yazd Jameh Mosque, Iran, photography by Bois de Jasmin. 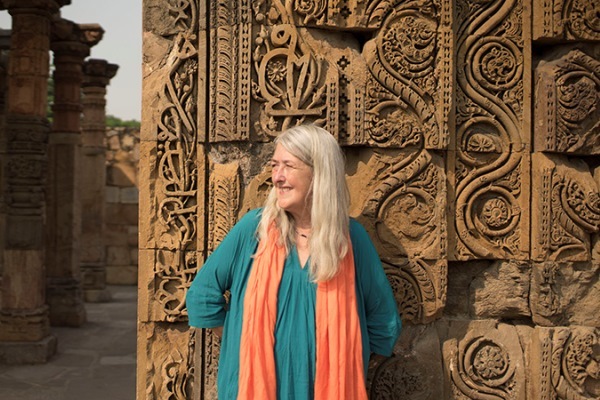 Mary Beard in Delhi, photography by BBC, via BBC website. This is a timely remark, given the travel ban. Karen: Thank you for this post, Victoria. I agree – the TV series (particularly David Olusoga!) is excellent and now I will search for Mary Beard’s book as well. Victoria: David Olusoga also has a book as part of these series, but I haven’t read it yet. It might be next. Like you, I liked Olusoga’s presentation. Tiffanie: Marvelous! Thank you for sharing this perspective on art, culture, and how these are shared through time and space. I will look for the book this summer. Victoria: I agree with you. The best part of making any discovery is the way it makes you see the familiar things with new eyes, as you’ve put it so well. Cornelia Blimber: Hi Marco! It’s always my pleasure when somebody wants to read about the ancient world. Mary Beard has a style of her own, those who like it like it a lot, and she is reliable as an historian. So please read SPQR! David Stuttard Nemesis. Biography of Alcibiadus. Stuttard is a fabulous storyteller! Cornelia Blimber: Alcibiades of course!! Yes, the eminent historian Braudel..in an english translation, a Penguin, easy to find. I presume you read him in French! Reading the ancient authors is the best you can do, so enjoy your Plutarchus! You are doing right! Maybe you will like Herodotus as well, the translation by Tom Holland is very vivid (and the Penguin is a very handsome book). Cornelia Blimber: I found today ”Confronting the Classics” by Mary Beard…for € 12,50! Of course I could not resist. There is a review of Anthony Everitt’s Cicero. Rather severe: ” A patchwork of ancient texts, sewn together with a thread of common sense, guesswork and sheer fantasy”. Oef! Mary Beard is a better historian than Everitt, true. And likely she is right that he is too credulous reading Plutarchus: Cicero’s mother ”suffered few labour pains”. A common story ”of the birth of an extraordinary child”. True: extraordinary births are a literary topic, like dreams as well. But that does not exclude that sometimes they are true. Mary Beard is often on the sceptical side. It’s always the question: how reliable are the ancient authors? With all its weaknesses I enjoyed ”Cicero” because I have, like Everitt, a soft spot for Cicero. Cornelia Blimber: His eloquence, those beautiful sentences, he was my favourite author already at school. The way he made Latin a language fit for philosophy. The combination of weakness and self-esteem, making his way in Rome being a ”new man”.